With Arcane Power Power Cards, you don't need to crack open a rulebook every time you cast a spell. All the crucial information is at your fingertips. Just pick out the deck for your character class, select the cards for your character's powers, and you're ready to play the Dungeons & Dragons Roleplaying Game! 100 power cards, including all Warlock powers found in the Arcane Power supplement, plus a few blank cards you can customize. Game rules not included. 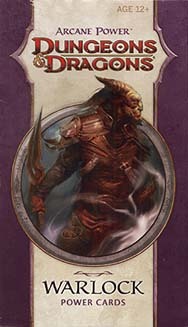 You will need Dungeons & Dragons Player's Handbook for complete game rules.